So despite all sensible thoughts to the contrary (too busy, too exhausted, too stretched, too near my physical limits, too old…), I’ve signed up for another MOOC. This time I’m on Coursera’s ‘Introduction to art: concepts and techniques’ and I will be following the practical, Studio, route through. This means that as well as studying art, artists and art movements, I will also be attempting at least one art assignment per week – and engaging in peer review of other pieces. I am doing this for fun – but I am also looking for creative ways to improve teaching, learning and assessment at my University. My first MOOC was also from Coursera: Edinburgh University’s 'E-learning and Digital Cultures', a brilliant six-week course, tagged and tweeted as #edcmooc. As a student of that course I was really lucky that a friend got ‘in there’ before me and invited me into the Google+ groups that were attached to it (one with thousands of people – one with just 16 members) and also into the FaceBook group. This meant that I very quickly found the size and shape of the social space that I needed to help me feel like I belonged - and that ‘held’ me in that course. It is ironic that this very human lesson occurred in virtual or cyberspace – and I’d argue that this is a lesson that we need to bring very quickly back to our physical, human teaching and learning spaces. If we want to keep and nurture our students – especially our non-traditional students – we need to re-humanise higher education. Our students are experiencing rapid educational change; for them university is highly marketised and impersonal: not so much a stroll across the quad – but a sense of pile ‘em high and teach ‘em cheap. Not hallowed halls, but commodified courses sold like toothpaste. So we should not be surprised when students notice and internalize this - or get switched off and drop out! But if we want to do something about it , we need to help students to find friends on and off their courses – get them actually into those Clubs and Societies - hook them up with Peer Mentors – make it human and they will feel humanized and they will stay and blossom. So as said, I was wobbling as to whether I could stay on this MOOC when SO BUSY… so I checked out the assignments for the course to see if they'd be so awful I could legitimately sigh and go. They looked brilliant. I wanted to do each and every one of them. So here’s another lesson for us in HE who teach anything but art: assignments CAN BE FUN. Yes, we are serious academics, intellectual gatekeepers of the academy; maintaining high standards and blah blah blah… But that does not mean that we have to set tasks that are boring, dull, re-gurgitative – we can challenge and extend our students. This #artmooc is setting some wonderful assignments that will oh so easily translate into activities to enrich any module. So this week we looked at line, shape, value, texture, colour and collage and for our first assignment we had to construct and post a self-portrait that captured the essence of who and what we were. We had to post an image of our picture in an online Forum, with a brief account of the what, why and how of it. We will move on to explore fantasy and the bizarre; correspondence, memory and mail art; photography, portraiture and collage; installation, space and the artwork; the world of wonder and cabinets of curiosities. I can see each of these as art – but also as reflective learning and multi-modal communications… I cannot wait to embed them in next year’s practice. 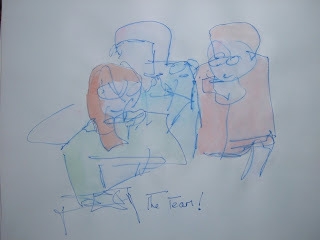 This is a drawing of me, on the left, and my colleagues Chris O’Reilly and Tom Burns with whom I am doing a lot of work at the moment – especially with digital artefacts. I have done this as a ‘blind drawing’ and watercolour. Blind drawing is where you look at what you are drawing – but not at the picture developing on the paper – and you try to keep your pen on the paper as well. What I like about blind drawing is that it cannot be a realistic representation of the object that you are drawing. You are released from accuracy and into exploration. You never know what the piece is going to look like… You may not even like the picture that emerges – at first. So I find that blind drawing becomes a lesson in patience and joy. This picture is deliberately not on good quality paper: there is nothing arty or iconic about it. I produced it to illustrate a conference presentation. I wanted to capture the sense of a moment, snatched and dashed down; a contingent, passing and ephemeral moment. 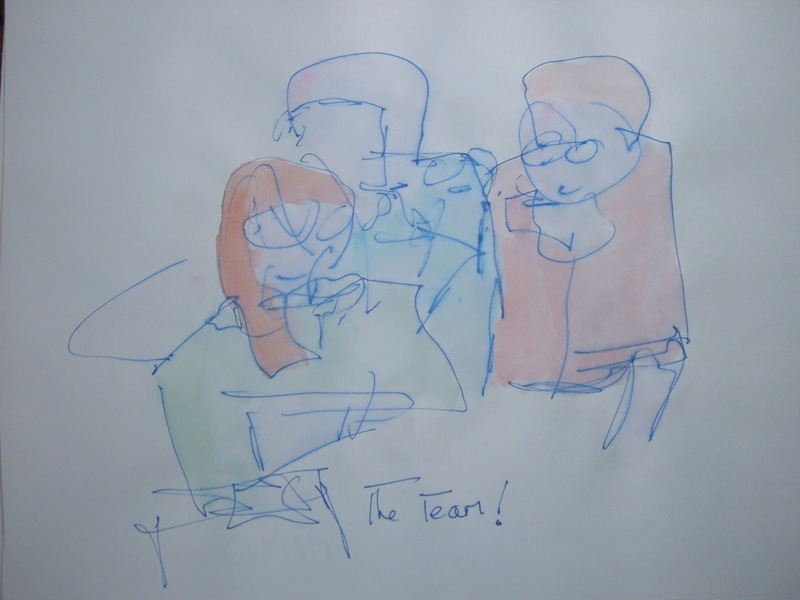 I wanted it to be our Team – but also to illustrate that anyone can draw something. I love the freedom of blind drawing - and the child-like quality of 'colouring in' the drawing once I have done it. When I do this I am that child again, totally absorbed, lost in the moment of fierce and purposeful play. I am definitely hoping for more of this fierce play through this course. Today I am attempting to produce an audio blog. I have talked about writing development and the use of new media. I have recorded this using the open source recording facility: Vocaroo. I used to be the Coordinator for Development - but on the deletion of our Learning Development Unit, I was absorbed in to the Centre for the Enhancement of Learning and Teaching (CELT). I have a brief to work with staff and students: improving the chances of student success at University - and working with staff to embed good practice within the curriculum. 'Studying at University', on the Hub, has information on studying and writing - with video clips, information, activities - and the recommendation that students tweet, FB or blog about their learning experiences. Writing Clinics: whilst rejecting the medical model - we use this shorthand to offer one-to-one support for students. We offer feedback on their writing and push them to do better. Whilst resource intensive, such one-to-one work can be especially transformative. Stuff support: We work with subject academics to embed good practice - and hopefully elements of our Study Hub - within their own teaching. We do use new media to support the development of student writing - with many staff building in wikis and blogs as part of the student learning and engagement process. At least one member of staff has won a National Teaching Fellowship based upon the development and impact of his student blog writing practice. At the same time, I think that we can use new media to develop alternative assignments for students. There will always be the settng of essays, reports and exams - but I am lobbying to get more staff setting the design and development of a teaching/learning resource or the production and critique of a digital artefact as the assignment. I can deliver Draw to Learn sessions with students - helping them conceptualise and communicate ideas visually. I have also delivered Digital Artefacts workshops with colleagues Chris O'Reilly and Tom Burns - and students have produced some wonderful work from these. The next step is to run these workshops for staff such that they can have the confidence and joy of embedding alternative assessments. Alongside this - I would like to embed practice gained from the E-Learning and Digital Cultures MOOC (Massive Open Online Course) delivered through Coursera by Edinburgh University - where the assignment was to produce a Digital Artefact - and to peer review three other artefacts. That is, the peer review was seen as part of the learning process. I would recommend a MOOC like this to anyone interested in exploring new media for teaching, learning and assessment: the best way to learn the digital is to do the digital. ... in the audio-blog was that we have several other strategies in place for supporting the development of writing. We have also developed a Peer Mentoring in Practice accredited module where second year students support the transition of a specific cohort of first year students - and we support the Mentors in developing supportive writing strategies with their mentees. It has been interesting using new media - especially Vocaroo - to produce this blog on using new media to support student writing. Be kind - it is frightening to cast my very first audio-blog out there into the ether. (That's a north London accept - by the way.). Finally, I am always interested in working with other people interested in developing these ideas - so do get in contact.